recent introduction to the West. Chinese cabbage is not really much of a novelty any more, although apart from those specifically devoted to Chinese cookery, most recipe books still don't even mention it as an ingredient. But it has become popular with many cooks, even though its uses are still quite limited by our lack of familiarity with it. Its main uses are for stir-fry and in salads. It is not suitable for use boiled like our Western cabbage. There are two main types of Chinese cabbage, the barrel type, also called pak choi, and the loose headed michihili type. Both are grown in the same way. Sow direct 1.5-2.5cm (½-1") deep in rows 18" apart, successionally from mid June to late August. 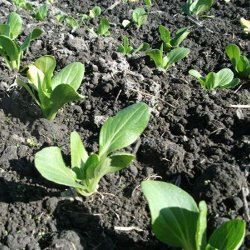 For early crops, pak choi may be sown from late April to early May in heat. The temperature must be kept above 18ªC (64ªF) for at least 3 weeks to prevent bolting. Harden off before planting out. Late sowings may be made in August and planted under cover in September in a cold greenhouse or polytunnel. Thin loose headed types to 30cm (12") apart, small pak choi 12cm (5") apart, and large pak choi 45cm (18") apart. Water little and often. Mulch if possible. Harvest by cutting or pulling up the whole plant, loose headed 8-10 weeks from sowing, pak choi 9-10 weeks from sowing.